"This is a good story of why the sport is growing the way it is, it has to do with “ambassadorship;” every person that plays this sport is an ambassador, some more than others. Byron Bentley took the bull by the horns approaching and soliciting condo owners and administrators of a local condo association until they said yes to putting lines for a Pickleball court on an underutilized tennis court. Much work went into this and the first Pickleball match/clinic was held last Thursday morning at the Indian River Club Condo and was a great success! There were approximately 16 people (10 residents and 6 guests) that turned out for the event. The guests were from the local Space Coast Viera Pickleball group. The clinic began with Pickleball instruction and demonstration by the Space Coast Viera group, followed by games which included IRC residents. It was perfect weather for this inaugural event. Thanks to the Space Coast Viera Pickleball group for coming to Indian River Club and making the clinic a success. Thanks also to the residents who came out to watch and learn the game. Hopefully Pickleball will be wonderful addition to the IRC community. Thanks to Byron Bentley for leading this push and to Phil McGibney for the help painting the lines on the tennis court and the being the lead for the clinic. The Space Coast has many ambassadors growing the sport- Congrats to all !! At this point we have about 97 players that currently play in Brevard County. There are FIVE public facilities that are currently hosting open play access and I am aware of FOUR other private pickleball facilities that will have been converted from tennis courts now or in the near future. As the summer arrives and some of our northern friends leave, we are approaching a record number of pickleball players at the Space Coast. 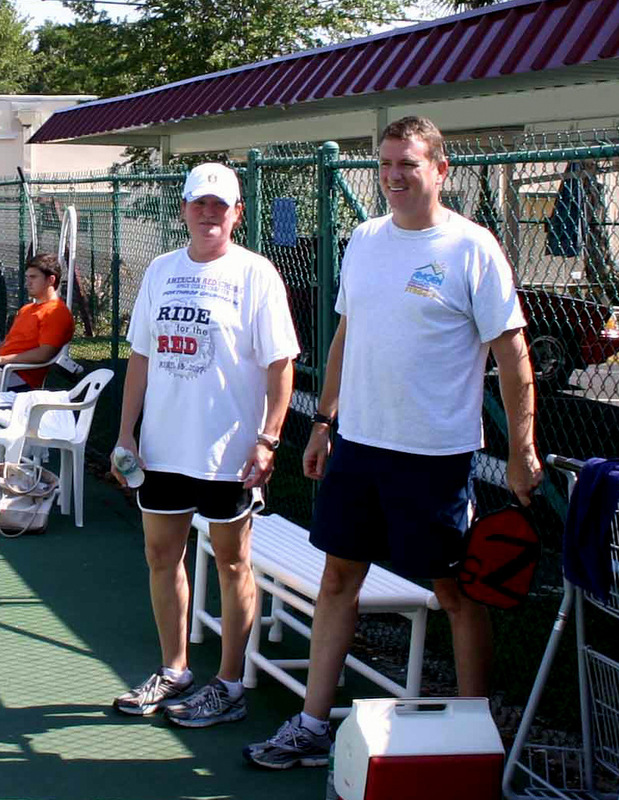 Satellite Beach Recreation Center will start hosting Pickleball again starting May 19th, on Saturdays at 7pm. We had a great turnout last year and hope that many of the same players and more can join us this year. In effort to promote our sport we will be conducting free beginner clinics at different host facilities in the area and I will also be asking for any volunteers that would like to assist in these clinics that will take place on Saturdays. We finally got a printer lined and are ready to order our Space Coast T-shirts. The first order will be white T-shirts with a black and green print of a paddle on the back and a smaller black print of a Pickleball on the left chest with the spaceship. 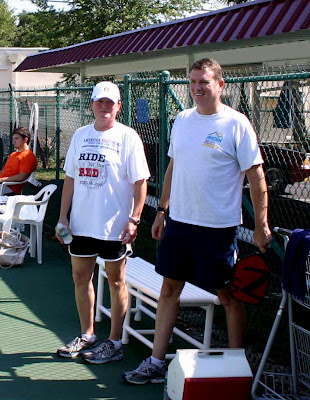 Thank you Suzan Griarml, a local artist and pickleball player, for coordinating this effort” An thanks to fellow pickleball player Byron Bentley for putting together a spreadsheet of all the Brevard public facilities' pickleball play schedules for all our players." Do you know whether they play anywhere in Vero beach. Been playing for 10 years elsewhere. 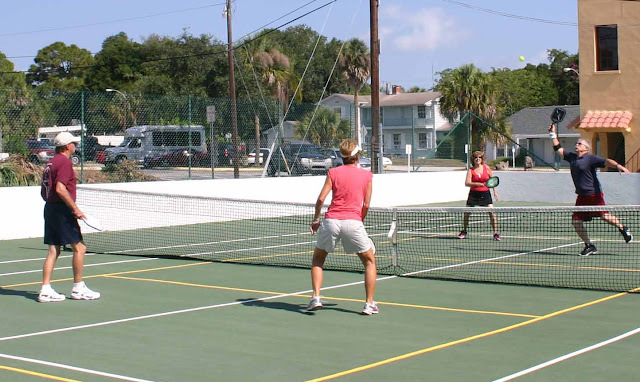 Are there any public access pickle ball courts in Davenport, Fl? Check the USAPA website for places to play. There is one private location in Davenport, but there are sure to be public facilites in neighboring towns. You may even try the Del Webb contact for additional information.